Professor Emeritus of History William Chaney has passed away at his home. He was 90 years old. An iconic figure in the college’s history, he was hired by President Nathan Pusey and joined the history department in 1952. He was appointed the George McKendree Steele Professor of Western Culture in 1966 and was honored in 973 as the first recipient of Lawrence’s Uhrig Award for Excellence in Teaching. Although he “retired” after 47 years in 1999, he continued to annually teach a class First and Third Terms, including this year. 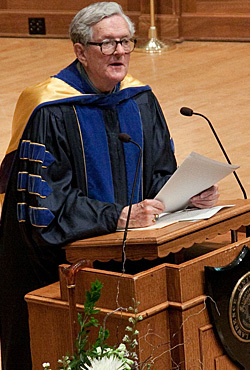 His 61-years of teaching is the second-longest tenure in the college’s history. One of the college’s most beloved teachers, Bill was a recognized scholar on the Middle Ages and a member of the Royal Society of Arts. A true Anglophile, he knew people throughout England and had many friends in Malta as a result of his annual trips to both places. His students number in the thousands, many of whom followed in his footsteps to become historians. He was a frequent instructor at Lawrence’s London Center and on tours of England with students, would famously pick out a random date from the 1100s or 1200s and tell them what happened on that specific day. The “Chaney oak,” grown from an acorn collected in Devonshire, England by a former student, was shipped to campus and planted in 1995 in sight of his Main Hall office as a tribute to him. A legendary lecturer who captivated his audience, whether in the classroom, a Bjorklunden seminar room or at an alumni event, Bill was known for the “salons” he would host regularly at his home for intellectual discussions with small groups of students, offering sherry to those of legal age, Dr. Pepper for those who weren’t. He was a Medievalist to the core, refusing to have a computer installed in his office. His fascination with the Middle Ages began in childhood in California, sparked by the poetry of Sir Walter Scott. He charmed many with a droll sense of humor, referring to himself as “a wave of the past.” He loved classical music, but often joked he didn’t like anything written after 1791. He earned his bachelor’s and doctorate degrees at the University of California-Berkeley and was a Fellow of the Society of Fellows at Harvard University. He was the author of the book “The Cult of Kingship in Anglo-Saxon England” and contributed dozens of articles and reviews to professional journals. A funeral service will be held Friday, March 22 at 11 a.m. at All Saints Episcopal Church, 100 N. Drew St., Appleton, with a reception following immediately afterward. Lawrence will celebrate Bill’s life and remarkable achievements with a memorial service on Saturday, May 18.